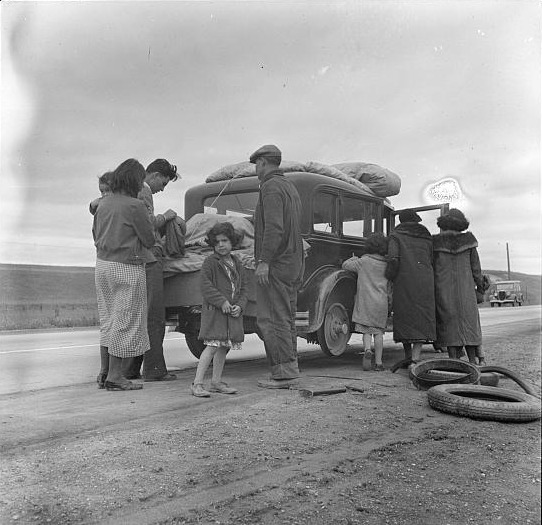 Welcome to Latino/a Mobility in California History, a collaborative website designed by the students of HIST/ERM 129. This course investigates 20th century California history with an emphasis on Latino/a mobility. Course themes include the right to mobility in the American West, ethnic quarantine, deportation, cars and leisure, freeways, and mobile imaginaries. Through the practices of blogging, digital curation, and primary historical research, we combine traditional historical methods with new media to ask how Latino/a mobility--as practiced, policed, and perceived--has intersected with race, gender, and class to produce varying life experiences in California and beyond. We invite you to tour our digital exhibit, Latina and Latino Mobility in 20th Century California, and visit images from our multimedia Pop-Up installation. There are many ways to navigate this site. Choose from the Main Menu to select individual project or follow the Path below to view the site from start to finish. Exploration and comments are encouraged! confirmation link that you must click on to go back to www.pinterest.com and finish signing up. Version 29 id 289720 of this page, updated 23 January 2015 by Genevieve Carpio. Created by Genevieve Carpio.